It may already be destroyed. A cold cricket cries in the pile of wet leaves. He wanders back and forth, unable to get past regret. At the end of the trail is a warm cabin with a single fire. There you may dry out those lonely years. […] En compagnie de Pauline Oliveros et Timothy Hill (qui travaille fréquemment avec David Hykes), David Rothenberg a mis à profit en 2013 le passage rarissime (une fois tous les dix-sept ans !) d’une espèce particulière de cigales dans l’agglomération de New York. Les trois musiciens ont arrangé une série de concerts, certains en extérieur avec les insectes infusant leur chant dans la musique analogue. Pour l’album Cicada Dream Band, la configuration a été reprise en studio puisque Rothenberg y a amené des cigales récoltées dans les arbres ! Ainsi, cet orchestre d’insectes participe à l’enregistrement, comme un quatrième et omniprésent instrumentiste. Quand ce ne sont pas eux, Rothenberg infuse d’autres sons d’animaux, mammifères marins ou oiseaux. C’est un disque de conversation musicale, réellement, de celles que le musicien organise, nous l’avons vu, naturellement. L’accordéon de Pauline Oliveros y déploie ses harmoniques ainsi qu’une toile réfractant la lumière qui captiverait les insectes, la clarinette de Rothenberg ne cesse de préluder dans un langage musical accidenté mais toujours harmonieux tel que beaucoup d’improvisateurs aimeraient atteindre. Car ici il s’agit bien de rejoindre un système naturel, non de parcourir l’anarchie des éboulements tonals pour y puiser, au petit bonheur, d’éventuelles pépites. La musique de Cicada Dream Band est au contraire un atelier de joaillerie où le matériau a déjà été fouillé, orpaillé. Le moindre crissement, la plus petite descente de cordes, la plus folâtre des phrases cuivrées, s’entend dans une symphonie champêtre où tout est juste. Il faut souligner à cet égard le rôle indispensable de Timothy Hill, dont la voix forme peut-être le plus solide passage du monde humain à celui des insectes ; ses fredonnements, ses faisceaux de gorge, ses vibrations, ses échos résonnent dans le registre des cigales, non à s’y méprendre – ce serait faire trop bon marché des prérogatives des uns et des autres – mais comme un enrichissement du vocabulaire musical de chacun. Une nouvelle contrée du Fourth World tel que l’ont défini Eno et Hassell se dévoile ici. You have to wander far, far into the reeds to find the Cicada Dream Band. This is either the music of a trio that have spent generous amounts of time in eachother’s company – bouncing ideas between them until the original concept is mashed into a bizarre new shape – or the work of three natural born curveballers, whose sparks of innovation come brightly and frequently, in completely unexpected colours. The energy levels are persistently high, twisting between synthesised vocal dissonance, silky clarinet flutters, earthy throat song and the congregative conversations of nature’s most flirtatious and boisterous birds and insects. I’m forever spoilt for choice – what to turn my attention to? The hooting acrobatics of the European blackbird? The glossy marble overtones of Timothy Hill’s singing? Instead of letting my mind ping back and forth as though observing a four-way tennis match, I often flop myself down in amongst the blur, allowing myself to be massaged by the ecstatic, pinball improvisation that shoots across the frame. They are all impeccable listeners. On “Three Of A Mind”, Oliveros’ v-accordion hangs on single notes like a held breath, or a hand feeling its way through the dark. Hill and Rothenburg respond accordingly, and before long the entire trio is slithering on their stomachs, hands held behind their backs, letting out soft and deliberate notes one after the other. As time slows down for one, the inner clocks of the others adjust accordingly – they are an eco-system within themselves, forever readjusting to retain balance and beneficial co-dependency. Veteran avant garde composer and V-accordion player Pauline Oliveros has joined forces with clarinet player David Rothenberg and throat singer Timothy Hill for „Cicada Dream Band“, a new project in the spirit of her other trio, the Deep Listening Band, responsible for many of Oliveros‘ most known releases. Like Deep Listening Band, the music on this album is an active form of ambient / classical avant garde / free improvisation which combines field recordings with live instrumentation. It comes off as a playful nature worship ritual, in much the way one might expect based on the title and lush green forested artwork. There are many lovely luminiscent and colorful instrumental tones, which intermingle pleasantly in whimsically exchanged volleys. In a sense it resembles free jazz, but consonance and beauty are emphasized to a far greater degree than would be typical of the genre. I enjoy the fluttering percolations of Rothenberg’s clarinet and bass clarinet, intermingling with Timothy Hill’s voice, itself reedy and rich in harmonics. The strangeness and unpredictability of Rothenberg’s note choices echo the esoteric and surreal classical music of the mid 20th century, such as Ligeti. The problem with this album turns out to be Oliveros‘ contribution. Her V-accordion is often set to cheesy, sampled sounding patches, such as a canned sounding voice saying ‚ooh!‘. It’s blocky and rigid compared to the rich organic timbres of the other two musicians, and therefore quite distracting. This kind of crude sampler use was generally abandoned after the 80’s, and for good reason. This album can often feel overly light or inauthentic, like exploring a forest made out of cardboard trees and tiny hidden speakers playing sound effects. The field recordings in the background are presented in such a way so as to sound like artificial loops. The soundscape created here could not be said to truly imitate the sound of a natural environment, and feels ultimately cartoonish and two dimensional. Timothy Hill is a competent throat singer, but not the most creative improviser, limited to rhythmic breaths and iterations of droning tone, which contributes to the feeling that the musicians are content to noodle about in the same space for the album’s duration. Utilizing a drone singer as a piece of trio in which the other two players are engaging in freeform, spasmodic outburts doesn’t seem to make sense. Oliveros‘ work has in fact erred in the opposite direction on many previous occasions, with many of her older pieces consisting of inexplicable and utterly unlistenable ugliness, but „Cicada Dream Band“ feels like something of an avant garde cliche to me. I would investigate deeper and more emotive ambient works like Lightwave’s „Cantus Umbrarum“ over this disk, which has a certain insubstantiality to it. It is a meandering, spacious recording, relaxing enough, but lacking in energy and direction. Rothenberg’s melodic fragments and soliloquys are often of interest, but I don’t have much of a sense that the musicians are building on each other’s ideas. I would rather hear his playing in another context. I can’t recommend this one. On Cicada Dream Band, three decorated local eminences of experimental music seize a unique opportunity presented them by nature—not exactly a once-in-a-lifetime chance, but not far off. 2013 was the summer of the 17-year cicada. The internationally known clarinetist David Rothenberg, who has done much recording of and writing about the sounds of nature, formed a trio with Kingston’s avant-garde accordionist and composer Pauline Oliveros (founder of Deep Listening and 2012 winner of the John Cage Award) and the harmonic overtone singer Timothy Hill. They imported some cicadas into the confines of Woodstock’s storied Dreamland Studio and recorded with them there. Other animal performers—electronically enhanced Latvian frogs, European blackbirds, a humpback whale, and a „slightly musical conehead“ (? )—made the final cut as well. The trio edited over three and a half hours of material down to 11 titled tracks totaling just over an hour. The music moves from a highly conversational chirpiness („Room at the Inn“) to multilayered and subtly patterned drones („All Creatures Get It“). Cicada Dream Band surprises with its timbral consistency; it is often difficult to distinguish the reediness of the accordion, the clarinet, and the remarkable range of tones that Hill produces from the processed animal voices. It is a timbral palette built around likeness, blending, and subtle variation. In which our three guides, Pauline Oliveros on the V-Accordion, David Rothenberg on the Bass Clarinet, Clarinet, iPad and Creatures and Timothy Hill using his vocal cords and resonating body cavities, draw us deep into a sophisticatedly blended oneiric suspension (of disbelief) involving, as the titles suggest, various recordings of insects, bird-calls and other ‘songs’ derived from non-human denizens of this planet as well as a distinctive instrumental palette threaded through with exploratory (human) vocalising. Oliveros, at least, has been investigating teeming electronic/natural environment crossovers, conceptually at least, since her Bog pieces in the 60s. 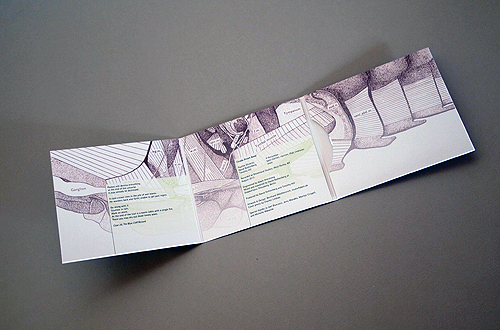 Here, as part of an unusually instrumented group that harnesses the potential efficacy and positive attributes (numerically unencumbered yet non-binary or solo-restricted – ‘Three of a Mind’, as a song title has it) of the trio format, she contributes reedy V-accordion washes to a complex yet limpid musical ecosystem that touches on Duke Ellington by way of Eric Dolphy, modern European Art Music, American 20th Century Composition, plainsong, throat singing, Native American chants, dinosaurs by way of avians, ancient insect campfire songs, Schubert’s trout, Vaughan Williams and the sounds of water-weeds swaying. These Other Green Vistas are presented with all the blithe expansiveness of the Fool as he steps out on his journey in the Waite Tarot, but in this case with all impending precipices weathered away into a rich alluvial plain – or yet to be rent by glaciation – danger replaced by a welcoming, verdant land full of the promise implied in the traveller’s sky-gazing face. Colourful vignettes cohere into a sort of utopian, synergistic and syncretic polemical nature documentary transmitted by telepathic poetic means (i.e. by music). The band itself: Troubadours of the mistily veiled fields of the unconscious (a New World, both America, the promise it represented to the European enlightenment mind, and the Cretaceous) stepping out to scent the air at dawn and twilight. Calls across gelid ponds, frogs’ calmly regard these penumbral scenes through amphibian eyes, mysterious thoughts like lily-pads realised in batrachian minds. An aura of calming, sinking, rising, steadying, buoyant, aqueous ambience permeates, which reminds me of the watery meditations in John Cowper Powys’s Wolf Solent. Simultaneously we are buried deep and secure in the cool mud like a dragonfly larva and skimming low like the fully grown creature over the flat surface of a body of inland water. An event that could of course be happening right now or millions of years in the past or future. It is right to celebrate expansiveness through non-human manifestation, but at the same time there is no escaping aspects of physical and temporal reality where these same creatures live their non-human lives not as symbols in our artifices but as real beings, squeezed and poisoned by human activities, a result of both lack of consideration and of conscious exploitation. Indeed, the Humpback Whale, poster child for this fact since Roger Payne and Songs of the Humpback Whale and on to Yes’s ‘Don’t Kill The Whale’, makes an appearance on one track. This human-cetacean nexus could also remind us of John C Lilly’s dolphin communication experiments. Rachel Carson’s Silent Spring also, still, in this era of the descendents of WW1 nerve agents (centenary celebrations, IG Farben – also manufacturers of TG favourite Zyklon B in WW2 – and subsidiaries please take a bow) re-packaged for use in industrial farming (or war on biodiversity) offers an implicit counterpoint to the delicate and well-meant celebration on show here. This same environmental-celebratory aspect, if it resonates at all, also behoves you to cogitate about and agitate against agricultural chemical warfare and industrial exploitation of the animal kingdom. Or it should do. Perhaps those precipices are around after all? Be that as it may, the shifting substance of the sounds, the meditative soloing against ever-uncoiling natural backdrops, the transition between human and animal, the thriving and vigorous visionary sonic eco-system, also recall a paradisiacal Dreamtime consciousness. A theme or attempt to evoke that is not unknown in other, related circles, if we in turn recall Annea Lockwood, her use of didgeridoos, or indeed the cross-cultural and trans-temporal rainforest wanderings of Jon Hassell. As the tracks unfold, sinuous river-bending vocal lines calmly propel us with the current through Siberia, Mongolia, Tibet, India, the Great Plains of America and on to Gondwanaland. How we got here. The mystery and magic of origins, back in the dawn of history, remembered deep in lizard-minds. Also implied, though, is the question of where we are going. Something to ponder whilst following the alternately intricately frilled and fluted (pun intended – even though there’s no flute, I know) and open and expansive mental byways offered up in a spirit of generosity for us to striate our wing-cases and inflate our throat pouches to. Rok 2013 był to wyjątkowy czas dla cykad – owadów rozpoznawalnych głównie po dźwiękach, wydawanych przez samce za pomocą narządów (tymbali) u nasady odwłoka, gdyż w Nowym Jorku można było spotkać ich miliony. Te muzyczne owady pojawiają się tylko raz na siedemnaście lat. W Stanach Zjednoczonych powszechnie nazywane są 17-letnią szarańczą. Z okazji tego wydarzenia David Rothenberg (klarnety, iPad, obiekty), kompozytorka Pauline Oliveros (akordeon) i wokalista Timothy Hill, postanowili uczcić ten moment serią koncertów w towarzystwie samych cykad. Okazało się, że muzykom to nie wystarczyło i udali się do słynnego studia Dreamland, aby zarejestrować wspólny materiał. W efekcie powstał niezwykłej urody album „Cicada Dream Band”. Nie od dziś wiadomo, że David Rothenberg to genialny artysta patrzący na muzykę przez pryzmat świata zwierząt. Bardzo dobrze pamiętam jego płytę „Bug Music” (Gruenrekorder, 2010), na której łączył odgłosy różnych owadów z partiami klarnetu. Mało tego, wykonywał te kompozycje mając na swoich plecach cykady (zdjęcie). Najmniej znaną mi postacią jest Timothy Hill. Wyczytałem, że współpracował z wieloma artystami, takimi jak John Cage, Bill Frisell, Jeff Buckley, Pete Seeger, Madan Gopal Singh i David Hykes. „Cicada Dream Band” to jedenaście kompozycji, dzięki którym przenosimy się do świata improwizacji i medytacji, w otoczeniu odgłosów cykad, świerszczy, humbaków, żab i ptaków. Krążek otwiera świetne nagranie „Who Said What?” będące doskonałą wizytówką całości, gdzie klarnet, delikatne tła akordeonu, gardłowy śpiew Hilla i elektronika, stały się czymś na kształt muzycznej abstrakcji. Ten wątek artyści umiejętnie kontynuują w dalszej części longplaya („Room at the Inn” i „Last Night in the Holocene”). Z kolei „Arc Hive” to wręcz ambientowy fragment. Nocny oddech lasu przy akompaniamencie cykad można poczuć w „Information National Forest”. W utworach „Several More Happened” i „As Many Inside as Outside” pojawił się nawet klezmerski mistycyzm. Zaś śpiew Hilla w kompozycjach „All Creatures Get It” i „Three of a Mind” skojarzył mi się z tym, co niegdyś robił Nusrat Fateh Ali Khan. W „The Longest Song in the World” odgłosy humbaka niczym zapętlone drony wzmagają uczucie głębi, a do tego są znakomitym kompanem dla klarnetu basowego. Płytę zamyka epickie „How We Got Here”, z imponującymi partiami akordeonu Oliveros i klarnetu Rothenberga. Momentami poczułem się jak w transie spod znaku Popol Vuh. Z pewnością album „Cicada Dream Band” to materiał do wielokrotnego odtwarzania. Każde kolejne przesłuchanie pozwala odkryć piękno tych kompozycji, w których kluczową rolę odegrały cykady, czyli latające pudła rezonansowe. Ich „rozmigotane” odgłosy są tak intensywne, że często przekraczają skalę 106 dB. Na „Cicada Dream Band” jedynie w subtelny sposób zaznaczyły swoją obecność. Dźwiękowe eksperymenty tria Oliveros/Rothenberg/Hill są wręcz emblematycznym przykładem „owadziej awangardy”. CDB is a similar sort of creature to it’s successor, which is no bad thing, but this time out the instrument seem to be taking a prominent role in the recordings. Previously it seemed that Rothenberg was reacting to the insect’s cavalcade of sound. Here the critters are more integrated into the music; as though the music was assembled around their exclamations. It works really well but it does seem more deliberate and, for lack of a better word, ‚composed‘ (which seems unlikely to me) than the previous. It’s a really lovely set. Rothenberg is centre stage and on fine form, Oliveros is a more withdrawn presence but her contributions are precise and work particularly well alongside Hill whose vocalisations are restrained and avoid the overt (and for me very annoying) vocal gymnastics that many avant-vocalists are prone to. Dieses Trio formierte sich 2013 aufgrund eines einzigartigen Naturphänomens, das sich alle 17 Jahre im Gebiet rund um die Stadt New York abspielt. Während einer kurzen Zeit siedeln sich dort Millionen von Zikaden an. David Rothenberg – Musiker und Naturphilosoph, der sich in seiner Arbeit intensiv mit Naturklängen, wie Vogel- oder Walgesängen auseinandersetzt – griff diesen speziellen Moment auf, um eine Reihe von Konzerten zusammen mit der 82-jährigen „deep listening“-Ikone Pauline Oliveros und dem Obertonsänger Timothy Hill zu spielen. Mittels intensiven Hinhörens interagierten sie während dieser Konzerte spontan mit den klanglichen Eigenheiten und Rhythmen der Insekten. Ihre CD Cicada Dream Band ist nun aber keine Dokumentation dessen, sondern eine eigenständige Studioproduktion mit 64 Minuten Musik. Das Trio begab sich auch hier in ein stetiges Spiel mit verschiedensten Tierstimmen. Die Auswahl reicht von Vögeln und Fröschen bis hin zu einem Buckelwal bei The Longest Song in the World und anderen Kreaturen; drei Tracks kommen ganz ohne field-recordings aus. Die drei Musiker driften vor allem hier komplett in esoterisch anmutende Stimmungen ab, voll Obertongesänge und jazziger Klarinettenmelodien. Oliveros spielt V-Akkordeon und fügt sich dezent in das Ganze ein, und das ist gut so. Who said what?, mein persönlicher Favorit und Eröffnungstrack der CD, beginnt mit singenden Heuschrecken und öffnet das Tor zu einer SciFi-New Age-Insekten-Parallelwelt. Music should not be heard, but listened to. Everywhere we go, there is music. It’s become such a widespread phenomenon, we hardly notice it any longer. It’s similar to cigarette–smoking in public places: some decades ago, it was such a common occurrence, nobody noticed it—except our eyes, throats, and lungs. Laws have been passed since, and smoking has been banned from public places. At times I wish piped music were banned from public places too. Everywhere we go, we are assailed by music we didn’t ask to hear and we normally don’t care for. It gets in the way both of thinking and of carrying on a conversation. It’s an instance of acoustic pollution. One of its by-products is that we now take music for granted, when music is one of the most marvelous things we humans can produce and/or listen to. The concert at the Experimental Intermedia Foundation was to celebrate the release of the CD, Cicada Dream Band. Should you wonder if this was the umpteenth New York artsy gimmick (admittedly a bad artistic habit of that city), nothing could be farther from the truth. The musicians involved are classically-trained virtuosi of the respective instruments, composers and musicologists who have dedicated their lives to music. Supremely accomplished clarinetist David Rothenberg has, inter alia, studied music-makers from the animal kingdom for decades, and to document his findings, as well as his jamming with unusual musicians, has authored three books: Why Birds Sing: A Journey Into the Mystery of Birdsong; Thousand-Mile Song: Whale Music in a Sea of Sound; and Bug Music: How Insects Gave Us Rhythm and Noise. Pauline Oliveros is a composer and accordionist whose work has been central to the development and refinement of post-war and electronic art music, which is how classical music has become known after WW II. She is also responsible for pioneering the concepts of “Deep Listening” and “sonic awareness.” Last but not least, Timothy Hill is a master of harmonic, or overtone, singing, which results in a way of singing acutely aware of the natural spectrum of harmonics that the vox humana can produce, thus creating a sound at once otherworldly and deeply human. Listening to it borders on the incredible, not in a circus-like way, but rather celestial—as if angels had suddenly alighted in the auditorium. So, how was the music produced by this avant-garde super group, with the contributions of selected magpies, humpback whales and cicadas? The listeners must set aside conventions that belong to a long time ago, as they will not find melody, or harmony (chord progression), or even rhythm as reference points. And yet, the music is far from abstract—it couldn’t be, as the singing of birds, whales and cicadas could not be more real. There is, indeed, harmony, not in the strict tonal sense, but rather in the very réussi attempt to harmonize with the sounds of nature, as well as with the harmonics within the vox humana; there is melody, albeit of a different sort, perhaps more modal than melodic; and finally, there is the incessant rhythm we all know from summers in the company of cicadas, but not nearly as in-your-face, or rather, in-your-ears. The resulting concert, in the etymological sense of concertare (‘to unite, to cause to agree’), from the Italian concertare ‘to harmonize’), was one of those rare experiences in which we realize that, despite years of acoustic pollution, we are still possessed of discerning ears and that, furthermore, they can be used as antennae. The phrasing of Mr. Rothenberg’s clarinet and bass clarinet (a magnificent old Selmer) has a few distant echoes of Jazz and classical music alike (I detected a little Eric Dolphy and Brahms in it), but is mostly original. Ms Oliveros’s work on the accordion was economical and yet so inspired that soon enough the listeners’ antennae realized that, somehow, she was playing only the right notes at the right times. As for Mr. Hill’s singing, it was a new and superb experience in its own right. And while the three musicians have arrived at this after decades of study, practice, and explorations, the resulting music came off as effortless. And beautiful, so achingly beautiful. In 1949 Theodor Adorno, one of the Frankfurt school theorists, wrote The Philosophy of Modern Music. In it he attacked beauty itself, since, in his view, it was a contributor to the ideology of advanced capitalist societies, and an ally to the sustainability of capitalism itself, which it rendered “aesthetically pleasing.” Only avant-garde music was capable of preserving the truth by expressing the reality of human suffering. Well, birds, whales and all sorts of insects sing—and not to express the reality of animal suffering. The concert was indeed of avant-garde music, but it was beautiful. Art of such supreme awareness and respect for all creations cannot but aspire to Plato’s World of Forms. And in that world, everything is beautiful. All of us listeners last Friday were lucky to witness something so new and at the same time so ancient. 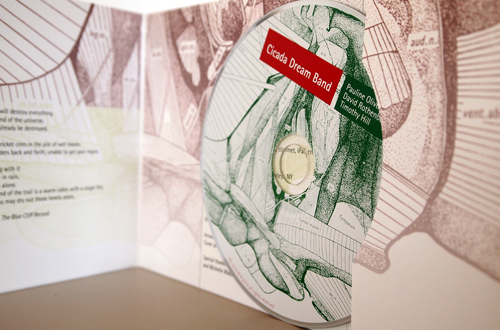 The Cicada Dream Band CD documents the same magic; I could not recommend it more. Guido Mina di Sospiro is co-author of the disinformation® book The Forbidden Book, co-authored with Joscelyn Godwin, and The Metaphysics Of Ping-Pong, published by Yellow Jersey Press, Random House, and long-listed for the William Hill Sports Book Award. David Rothenberg received deserved attention for his 2013 Gruenrekorder release Bug Music (issued in tandem with the book Bug Music: How Insects Gave Us Rhythm and Noise on St Martins Press), on which the woodwinds player used various insects as musical partners. 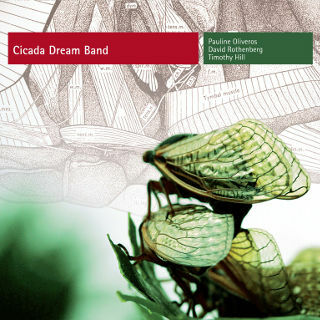 Rothenberg’s latest, Cicada Dream Band, represents a natural progression in that while it perpetuates the creature-oriented theme of the earlier release it expands upon it in two critical respects. First of all, the material supplements insect sounds with those of frogs, birds, and a Humpback whale; and secondly, Rothenberg, credited with bass clarinet, clarinet, iPad, and creatures, is accompanied by Pauline Oliveros (V-Accordion) and Timothy Hill (voice) on the sixty-four-minute recording, which was culled from three-and-a-half hours of music laid down at Dreamland Studios in West Hurley, NY during August 2013. Cicada Dream Band is, as stated, a different animal than Bug Music. Less strictly governed by the insect theme, the new recording feels looser in spirit and more open to the explorative interplay of the three participants. In that regard, it’s telling that three of the eleven pieces eschew creature sounds and feature ensemble interplay only (while the aptly titled “Three of a Mind” is perhaps the best example of these settings, the album-closing “How We Got Here” is striking, too, especially when it threads horn-like blasts into its arrangement). That said, the fact that the first sounds on the recording’s opening piece “Who Said What?” are those of creatures signifies the importance of that dimension to the project. But as one attends to the subsequent interplay of Rothenberg’s clarinet, Hill’s wordless flurries and drones, and Oliveros’s digital accordion, it quickly becomes clear that one is in the presence of an unusual and unique soundworld. Though Rothenberg might stand out as the most conspicuous soloist, the others are hardly supporting players; if anything, they solo as much as Rothenberg. It’s Hill, for example, who interacts most prominently with the European blackbird during the opening minutes of “Room at the Inn,” even if the others‘ contributions gradually prove equal to his as the piece develops; the later “As Many Inside as Outside,” on the other hand, is clearly a Rothenberg set-piece, given that his clarinet solo is, aside from the rhythmic whirr supplied by the Slightly musical conehead, the only instrument sound heard. That the sounds within a given setting sometimes seem to gather into separate fields—Hill interacting with the creatures and Rothenberg with Oliveros—also doesn’t surprise, given the natural tendency for the vocal and instrumental elements to gravitate towards those of their own kind. But such a statement runs the risk of overgeneralizing, for there are numerous instances where Rothenberg is as intimately involved with the creatures as Hill (see “Several More Happened,” for example, where the saxophone communes with French cicadas and a Sage thrasher). Anyone familiar with Oliveros also will be familiar with the term Deep Listening, which she coined in the 1980s to accentuate the need for sensitivity and concentration in both listening and musical practice. While Rothenberg, Hill, and Oliveros share equal billing and compositional credit for Cicada Dream Band, it’s easy to see it as an obvious example of the Deep Listening aesthetic at work. Certainly each participant is equally responsible for the arresting settings featured on the recording. Filozof, milovník přírody a hudebník David Rothenberg byl letos v červenci výraznou postavou pražského festivalu vs. 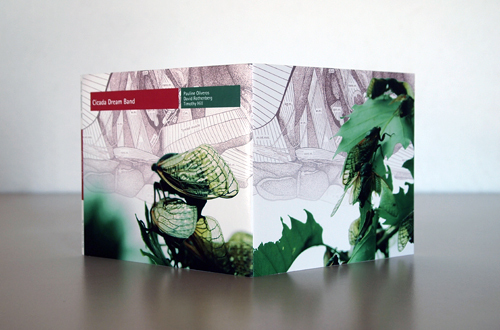 Interpretation, kde v rámci své prezentace představil také zbrusu nové CD Cicada Dream Band a na pódium si přizval také průkopnici elektroakustické hudby, akordeonistku Pauline Oliveros. Vokalista Timothy Hill a cikády se přidali pouze ze záznamu. Timothy Hill byl v The New York Times označen jako „virtuóz tibetské pěvecké techniky“, působí v alternativní keltsko-jazz-folkové formaci Sleeping Bee či v David Hykes and the Harmonic Choir a v neposlední řadě spolupracoval například s Johnem Cagem, Joem Manerim či Butchem Morrisem. Všechny tyto naturální i improvizační zkušenosti ve Snové kapele dokonale zúročil a podtrhl její uvolněnost. Vše tu pochopitelně umocňuje punkevní hra Pauline Oliveros, která vyzývá ke skutečně hlubokému naslouchání. Jistý prim tu ale bezesporu hraje David Rothrenberg, který se ve sféře soudobého jazzu proslavil zejména díky společnému CD s fenomenální pianistkou Marylin Crispell One Dark Night I Left My Silent House. Jeho temná i štěbetavá preludia na klarinet a basklarinet dokonale souzní s jeho vášní pro zvířecí svět. Terénní nahrávky z animální říše nepoužívá jako doplněk, ale jako hybnou sílu. Většinou se totiž snaží o přímou interakci s nejrůznějšími druhy ptáků, hmyzu a v poslední době zejména velryb. Protagonisty tohoto alba tak nejsou jen hudebníci samotní, ale i rudohlavá luční kobylka, evropští kosi, francouzské cikády, lotyšské žáby, jakýsi americký drozdovitý pták a výraznou roli tu hraje i v Čechách se vyskytující pěvec se signifikantním názvem sedmihlásek hajní. Kapitolou samou pro sebe jsou pak běluhy v The Longest Song in the World, kde se spojují oceánské hlubiny v dlouhých vlnách s nebeskými výšinami. Jakousi sumarizací je závěrečná třinácti a půl minutová meditace How We Got There, která už bez použití animálních zvuků jakoby vystihovala principy naší matky Země a snažila se proniknout do její prapodstaty. Nesmírně emotivní dílo plné sounáležitosti, harmonie a nejpozitivnějších vibrací.